Producer Ryan Murphy's Emmy and Golden Globe award winning anthology miniseries American Horror Story has paid big dividends as his newest installment, American Horror Story: Freak Show has broken all ratings records for FX with its premiere episode last Wednesday night (10/8/14, 10-11:32PM). In light of that record-setting performance, FX has rewarded American Horror Story with a 13-episode order for the fifth and next installment of the show, which will debut in October 2015, it was announced today by John Landgraf, CEO, FX Networks and FX Productions. With Live+3 time-shifted viewing, the premiere telecast of American Horror Story: Freak Show has become the most-watched single program in FX's 20-year history and that includes all programs with Live+7 deliveries. AHS: Freak Show's debut delivered 10 million Total Viewers, 6.54 million Adults 18-49, and 4.08 million Adults 18-34, surpassing the network's previous record holder, the recent seventh and final season premiere telecast of the hit drama series Sons of Anarchy on Sept. 9th (9.25 million Total Viewers and 6.1 million Adults 18-49). 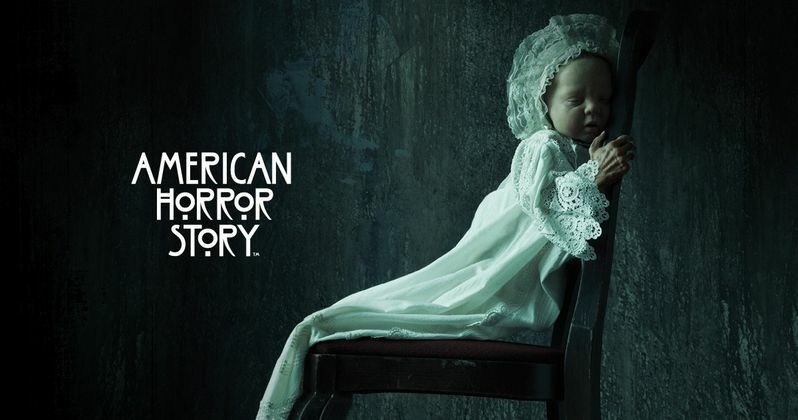 American Horror Story: Coven held all previous records in delivery Adults 18-34. The premiere and two encore telecasts of American Horror Story: Freak Show combined to deliver 13.36 million Total Viewers, 8.6 million Adults 18-49 and 5.25 million Adults 18-34. Here's what FX's John Landgraf had to say about the renewal in a statement. "The American Horror Story anthology has had the highest growth trajectory of any show in FX history, not to mention an unprecedented track record of success in awards recognition. With Ryan Murphy and his partners, Brad Falchuk, Dante Di Loreto and Tim Minear at the helm, the show's success is not surprising. AHS continues to deliver amazing stories, a brilliant troupe of actors led by Jessica Lange, and a visual style unlike any other on TV. With Nip/Tuck, Glee, The Normal Heart, and American Horror Story, Ryan Murphy has established himself as one of the most successful and prolific producers of this generation. We expect AHS: Freak Show and the next incarnation of AHS to further his legacy." The premiere ratings for American Horror Story: Freak Show topped the premiere episode of last year's third installment of the franchise, American Horror Story: Coven, by +38% in Total Viewers (10 million vs. 7.27 million), +29% in Adults 18-49 (6.54 million vs. 5.07 million), and +40% in Adults 18-34 (4.08 million vs. 2.92 million). The premiere ratings for American Horror Story: Freak Show topped the 13-episode average of American Horror Story: Coven, by +53% in Total Viewers (10 million vs. 6.53 million), +44% in Adults 18-49 (6.54 million vs. 4.55 million), and +61% in Adults 18-34 (4.08 million vs. 2.53 million). Since its launch in 2011, compared with the average of its full first installment, American Horror Story: Murder House, the franchise has grown +148% in Total Viewers (4.03 million), +119% in Adults 18-49 (2.98 million) and +127% in Adults 18-34 (1.79 million). AHS: Freak Show has 12 all-new episodes airing Wednesdays at 10 PM ET/PT through January. In Wednesday night's episode, "Massacres and Matinees" (Oct. 15), a citywide curfew threatens to shut down the Freak Show. Dell Toledo (Michael Chiklis), a strongman from Ethel's (Kathy Bates) troubled past arrives at camp. Gloria (Frances Conroy) arranges a terrifying play date for Dandy (Finn Wittrock). The Tattler Twins (Sarah Paulson) reveal a talent that could knock Elsa (Jessica Lange) from the spotlight. Written by Tim Minear; Directed by Alfonso Gomez-Rejon. American Horror Story: Freak Show begins its tale in the quiet, sleepy hamlet of Jupiter, Fla. The year is 1952. A troupe of curiosities has just arrived to town, coinciding with the strange emergence of a dark entity that savagely threatens the lives of townsfolk and freaks alike. This is the story of the performers and their desperate journey of survival amidst the dying world of the American carny experience. Freak Show features an extraordinary cast including Oscar, Emmy, and Golden Globe award-winners Jessica Lange and Kathy Bates, Golden Globe Award winner and Academy Award nominee Angela Bassett, Emmy Award nominee Sarah Paulson, Emmy and Golden Globe winner Michael Chiklis, Oscar and Golden Globe award nominee Gabourey Sidibe, Emmy Award nominee and Golden Globe Award winner Frances Conroy, Emmy Award nominee Denis O'Hare, Emmy Award nominee Patti LaBelle, Evan Peters, Emma Roberts, Finn Wittrock, John Carroll Lynch, and Wes Bentley. Ryan Murphy, Brad Falchuk, Dante Di Loreto, Tim Minear, Jennifer Salt, James Wong and Bradley Buecker are Executive Producers of American Horror Story: Freak Show. It is produced by Twentieth Century Fox Television. Last week, FX announced the spin-off anthology miniseries of American Horror Story, American Crime Story beginning with the 10-episode American Crime Story: The People v. O.J. Simpson, which starts production in 2015.